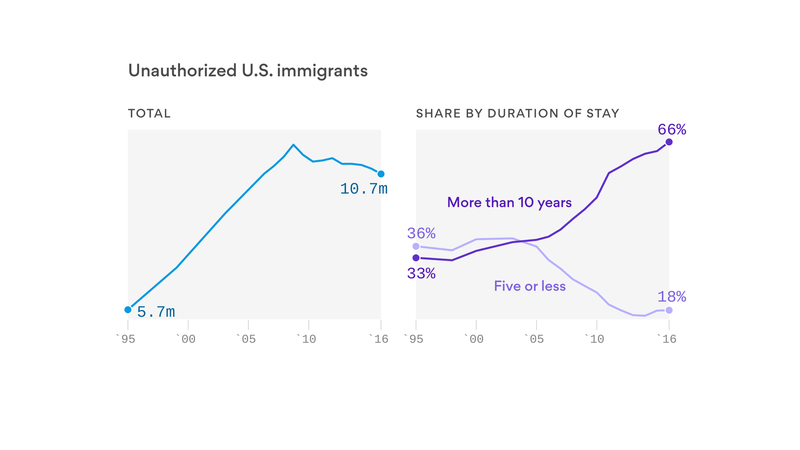 The number of unauthorized immigrants in the U.S. has dropped to the lowest level in 10 years, but today's immigrants are more likely to have been in the U.S. for more than a decade, according to a new study by Pew Research. Why it matters: While the Trump administration wages war on illegal border crossers and immigrants who overstay their visas, the actual number of unauthorized immigrants in the U.S. has been falling — even as the share of the population born outside the U.S. has reached an all-time high. Between the lines: The trend is largely due to a dramatic decrease in the number of Mexican immigrants illegally entering the U.S. Meanwhile, there's been a notable uptick in the number of unauthorized immigrants from Central American countries. Central America was the only region that had more unauthorized immigrants in the U.S. in 2016 than in 2007. By the numbers: The median number of years that unauthorized adult immigrants have been in the U.S. reached a new high of 14.8 years in 2016, and most have been in the U.S. for more than 10 years. This likely means there have been fewer new, unauthorized immigrants coming to the U.S. in recent years. The Trump administration has claimed that illegal immigrants steal American jobs, but the share of the U.S. workforce made up of unauthorized immigrants has fallen over the last decade to 4.8%, according to the report. The total number of unauthorized immigrants include the roughly 700,000 immigrants who came to the U.S. as children and are protected from deportation by DACA, as well as at least 317,000 people from 10 nations protected by Temporary Protected Status — both programs the Trump administration has sought to end or cut back on.